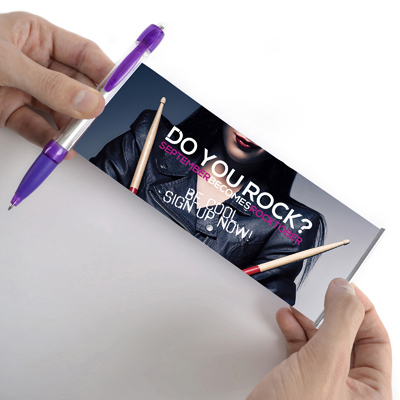 Description: A Pen that can carry a very large message on a roll out banner (180x67mm) that can be printed both sides in full colour. Black or Blue ink. Black, White, Orange, Light Green, Green, Pink, Trans, Yellow, Purple, Light Blue, Blue, Red. Product Size 146 x 10 mm dia. Lead Times 4-5 weeks from artwork approval.